Last year around this time, I took the schools who made the NCAA basketball tournament and decided to look at it from a lacrosse perspective. Several websites and sports blogs will do this for football or other sports, because most of those schools have division one or at least varsity programs. Lacrosse is different, and most of these will be club teams, which certainly makes this an interesting exercise. 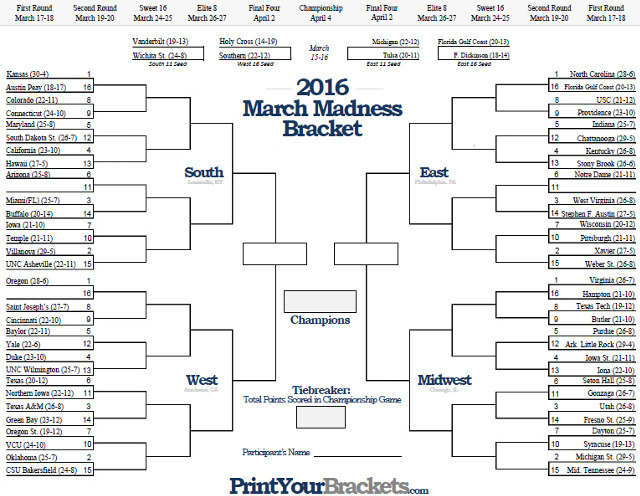 This is all for fun, so enjoy the March Madness, lacrosse edition for the second year. At 5-1, Kansas is a rather dominant team in the West Division of the Great Rivers Lacrosse Conference of the MCLA. Which is club lacrosse. Yeah, we have to use club lacrosse teams. Kansas has scored 72 goals and given up just 36 and has a 16-1 win this year. They’re pretty good. Austin Peay does not have a lacrosse team. … Oh. This is off to a great start. Usually, Colorado is a power in the MCLA. 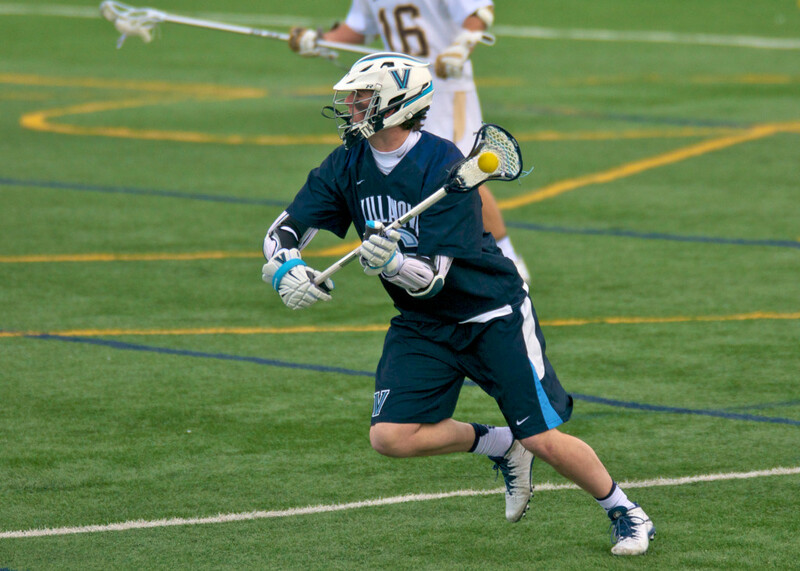 This season, the Buffaloes are 4-2 and tied for second place in the Rocky Mountain Lacrosse Conference. Tied with three other teams, they trail the 7-1 BYU team. The two losses were one goal losses to powerhouse teams such as Grand Valley State and Chapman University, so the Buffaloes’ record is deceptive. Meanwhile, #24 Connecticut is 4-0 and has an impressive 56-18 goal differential. The Huskies have held teams to two and three goal totals at points this season. This game is actually really intriguing and would be cool to watch in real life. Edge goes to Colorado though, playing tougher teams, and are ranked #3 in the MCLA poll. Maryland is one of the best teams in the country, despite a tough start to this season. Two straight wins made up for losses against Yale and Notre Dame, and now the Terps are ranked #6. Maryland should continue to be a strong team all season, but in a year with so much parity, the Terps’ two losses have been a big part of it. South Dakota State is in the Great Lakes Lacrosse League but is yet to begin its season. It begins play on March 19, but that’s after this tournament, so a forfeit to Maryland. California Berkley (I guess?) is 3-5 in the Western College Lacrosse League of the MCLA, and has allowed and scored exactly 77 goals. Hawaii hosts this really cool amateur lacrosse tournament every year, but the University does not have a lacrosse team (or at least a team Twitter account, which is the last resort). Vanderbilt is 1-6 and has scored 33 goals and allowed 86 so that’s pretty bad. Arizona shutout a team this year. The Wildcats are 5-2, and we’ve established that Vanderbilt is pretty bad, so I guess the Wildcats have to win. Also, Arizona is ranked #5 in the MCLA. At 3-5, Miami is in second to last place in the South East Division of the SouthEastern Lacrosse Conference. The Hurricanes have allowed 20 goals more than they have scored. That is not good. Buffalo is 1-0 and has played one game, a 12-7 win over West Virginia. Buffalo’s going to get this victory. Iowa is 1-1 and leads the West Division of the GRLC because conference play exceeds all and the Hawkeyes are 1-0 there. Behind them is a 5-1 team, which is pretty weird. Temple is 3-1 in the NCLL (National College Lacrosse League). I honestly don’t know much about the NCLL, so Iowa wins this one. With a 5-1 record, the Villanova Wildcats have risen to a #7 ranking in the nation. Its only loss an OT defeat to Harvard, Villanova has won five games in a row, including victories over Penn State. Could not find UNC Ashville to have any lacrosse anywhere, which is good because they might have challenged the top ranked division one team Villanova. North Carolina comes into this tournament as a #1 seed because, basketball, but the lacrosse team out of Chapel Hill would not have earned that ranking with two upset losses this season to Hofstra and UMass. North Carolina is 4-3, #17 in the nation, with just Johns Hopkins as a quality victory. #22 Florida Gulf Coast University actually has a team. It is 4-4 with a 1-0 record in conference play in the North West Division of the SELC’s division two conference. 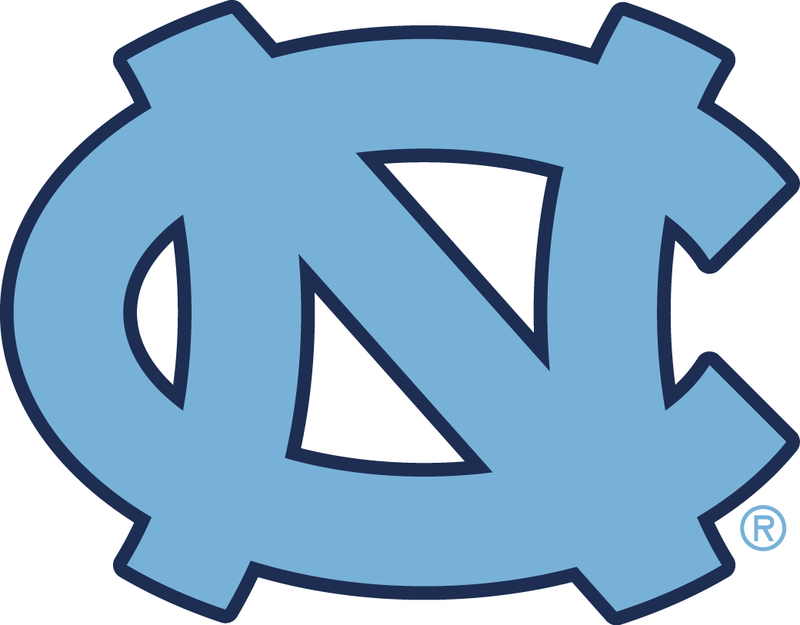 North Carolina has to win, closely avoiding another upset. At 3-3, Providence has had a solid season with wins over Holy Cross, Sacred Heart, and Vermont. Led by Will Mazzone, one of the more underrated attackmen in the country, the Friars are a sneaky good team. USC is a club team, so they lose, but is actually really intriguing. The Trojans are 5-5 but have scored 107 goals to just 66. A lot of that comes from a 20-0 win over Washington State, probably (Washington State is really bad at club lacrosse). Indiana is in first place in a pretty not-good club lacrosse conference. The Hoosiers are 4-2 but everyone else in the conference has just two games played except Miami of Ohio, who has eight. Chatanooga is the #9 ranked team in the NCLL with a 5-0 record. In second place behind 2-0 Furman (for some reason, 5-0 is behind 2-0 and both are 2-0 in conference), but Chatanooga appears to be the better team. 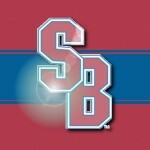 Stony Brook has emerged as one of the stronger teams in the nation, including a big win over Hofstra just this week. The Sea Wolves are 5-1, good for #15 in the country with other wins over Rutgers and St. John’s. Kentucky does not have a lacrosse team, but the Kentucky Stickhorses pro team once existed. That doesn’t help against Stony Brook. Our first all D1 matchup! Notre Dame is coming off of a crushing overtime loss to #1 Denver, but the Fighting Irish are still #2 in the country with a 4-1 record and key wins over Georgetown and Maryland. Michigan, at 3-3, is seeing its most successful year in program history and already picked up a huge win this year over Colgate. Despite the success from the Wolverines this season, it has to be the Fighting Irish as one of the best teams in this tournament that advances. Guess what, Stephen F Austin lacrosse exists. The Lumberjacks play in the Lone Star Alliance in division two of the MCLA, and the team is 4-3, good for second place in the conference behind the 6-0 St. Gregory’s University (5 points whoever has heard of that school). However, with 77 goals allowed with just 60 scored, it seems like the ‘Jacks struggle to score. Meanwhile, West Virginia is 1-6, in last place in the SouthEastern Lacrosse Conference (they want their grammar like that, so whatev). So despite some downfalls, the Lumberjacks will advance! At 2-2, Pittsburgh is in second place in the MCLA’s Central Collegiate Lacrosse Association. The Panthers are 1-0 in conference play and have 47 goals this season, but are allowing 10 goals per game. Wisconsin’s team has a Twitter account that hasn’t worked since 2014 and a broken link to the MCLA team page so my guess is they aren’t playing lacrosse in Wisconsin. Xavier does have a lacrosse team, and it took a long time to find. They haven’t played a game yet this season, but are in the National College (club) Lacrosse League and technically in fifth place of division two’s Midwest Conference. Weber State exists but for the life of me I can’t find what league or if they have a website. Holy Cross is an average team in the reality of division one lacrosse, but as one of the lone D1 teams in this bracket, the Crusaders can pull off one of the best upsets of this tournament, rankings wise. Of course, being 0-7, you could make the argument that the Crusaders shouldn’t even be in this tournament, but, again, this is for fun. Oregon is 5-1 in the MCLA and #12 in the nation. Does that mean the Ducks could beat Holy Cross? …. Maybe. But I’m reluctant to have a club team beat a Patriot League team, though if it could happen, it would be here. At 4-2, the St. Joseph’s Hawks are looking to replicate last season’s sleeper season and currently are tied for the top of the Northeast Conference. They haven’t been challenged, with all mediocre teams on the schedule, but still, 4-2 is a solid record. Cincinnati is listed as winless in an NCLL conference it is alone in. I guess the D1 St. Joseph’s wins, by a hair. Yale is one of the nation’s best teams. At 5-0, including a win over Maryland, the Bulldogs are #4 in the country and one of the best teams in an extremely competitive Ivy League. At 2-4, Baylor hasn’t found much success in the South Division of the Lone Star Alliance. 0-3 in conference play, it’s a lost season for the Bears. Even if they were 15-0 though, Yale has to win. Duke has had a weird year, with losses to Harvard, Loyola, and Richmond, but remains ranked #11. The Blue Devils may not be the power they have been in previous years, but are still one of the 15 best in the country at least. Texas is 4-6 and a rather unimpressive, not important team in the grand scheme of a Lone Star Alliance conference in the MCLA that is rather high quality. The Longhorns are 2-2 in conference play and have allowed three more goals than they have scored. No team for Northern Iowa, so reluctantly, Texas advances. Texas A&M has 156 goals. I don’t care if it is club lacrosse, that’s insane for a team with just 11 games (they’ve won nine of them). The Aggies lead the Lone Star Alliance’s South Division, and other than SMU, are the most dominant team. There’s no Green Bay. We’ve hit a rough stretch. Oregon State, ranked at #15 in D1 MCLA, is 5-2 and 3-0 in conference play and leads the Pacific Northwest Collegiate Lacrosse League. The Beavers have scored nearly 50 more goals than they have allowed, and they’ve shutout a school called Chico State University and held Washington State to two goals. VCU is ranked at #20 with a 3-0 record in the NCLL. The Rams are in first place in the Tidewater D2 conference. Still, Oregon State beat a team 20-0. Oklahoma is 5-3 in the MCLA’s Lone Star Alliance. The Sooners would be the best team in the conference if it wasn’t for SMU’s ridiculous 10-0 season. With 116 goals in eight games, the Sooners have one of the best offenses in all of club lacrosse. I saw a tweet that Bakersfield is starting a club lacrosse team, but no data exists, so Oklahoma wins. Another matchup of two D1 teams… Kind of. Hampton has played just one D1 game so far, and it was against a hapless Wagner team. The Pirates are a new program and will improve, but for now, facing a Virginia team is a tough task. Interestingly, however, the Cavaliers are having an off year. At 3-4, Virginia has lost to High Point, Loyola, Syracuse, and Cornell. The Cavs get past this round, but this is a team in trouble. Texas Tech is 0-6 and one of the worst teams in the MCLA. With just 39 goals in those six games, an anemic offense will not help the Red Raiders this post season. No team for Butler, but they are adding a D1 women’s team, so that’s cool. Purdue is 1-0 and in second place in the Great Rivers Lacrosse Conference. They defeated Oakland University, 13-3, which isn’t bad at all. Would you ever guess that Little Rock does not have a team? At 3-4, Iowa State is in last place in a two team conference. Don’t you love club lacrosse? With 56 goals to 67 allowed, the Cyclones are not an excellent team. I was really surprised that Iona, as a Long Island school, did not have a team. At 3-3, Gonzaga leads a mediocre PNCLL division two. The Zags have scored more goals than they have allowed, so there is some potential to do something. Utah is 3-4 in the extremely competitive Rocky Mountain Lacrosse Conference, but just one game back of second place. However, the team has been shut out once this season by Arizona. Women’s team, no men’s for Fresno. It could be argued Syracuse should not be in this basketball tournament. Good thing that we’re playing lacrosse here. The Orange are at #3 in the country with a 5-0 record, including wins over Virginia and Army and are one of the deepest teams in the country. At 5-0, Dayton is in first place in division two of he Central Collegiate Lacrosse Conference and #1 in MCLA’s D2 poll. The Flyers are a good club lacrosse team. The Orange are a good D1 lacrosse team. Michigan State gets lucky as a #2 seed, because with a 1-3 record, the Spartans are not a strong team, despite a #16 ranking early in the MCLA season. In fourth place in a week Central Collegiate Lacrosse Association, Michigan State has just 28 goals and struggles to put the ball in the net. In the NCLL at one point, Middle Tennessee State’s Twitter account was hacked in 2011. The third ranked Colorado Buffaloes of the MCLA, as we established, are pretty good despite two blips to two really good teams. Kansas, at 5-1, is also solid. However, the Jayhawks have faced some bad teams. Kansas has a tough schedule ahead, but the Buffaloes are in the upper echelon of non-varsity lacrosse. 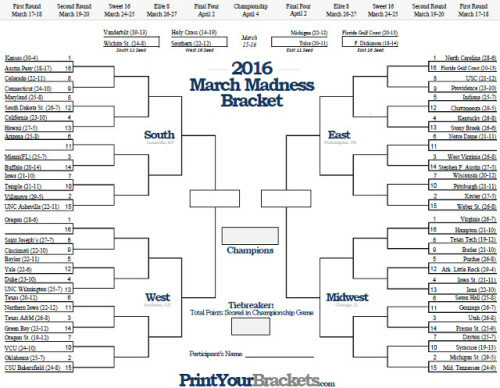 I barely allowed California to exist in this bracket, and that’s only because there was nothing on Hawaii. However, I will take this space to talk about Maryland. The Terps are not as strong of a team as was though, and the ACC is becoming interesting. 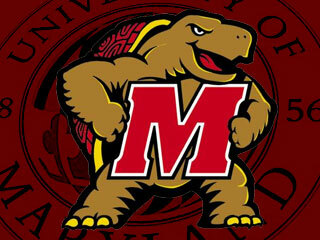 It was a big win against Princeton this week, 17-5, so maybe Maryland is fine. They sure beat the non-existant California. I kind of like what I’ve read about Buffalo now, but Arizona is a fifth ranked team in the MCLA and had a shutout which I am still excited about. This is a respectable lacrosse game that you could see on any Saturday. It would probably be the game you turned on when the other three games you were watching went to break, but still, respectable. And since UMass upset UNC this year, Providence would have a shot. But have to take the ‘Heels still. Like Buffalo, I just liked Chatanooga. But Stony Brook just beat Hofstra and I’m excited about that, so I guess the Sea Wolves can win. I also liked Stephen F Austin but Notre Dame just played the best collegiate lacrosse game of the year. Xavier barely existed and I didn’t really like Pittsburgh, but existence wins, so Pittsburgh. This is bad even for D1 varsity game and St. Joseph’s wins. Now THIS is an awesome game, and I’m going to take Yale to advance with the upset. I just don’t trust the Blue Devils this year. Going to give this game to Yale, led by a fantastic season from Ben Reeves. Once again, A&M has 156 goals and Texas beat a team by a forfeit. Oregon State is a ranked team, and I like the offense from Oklahoma, but the schedule is also much tougher for the Beavers. 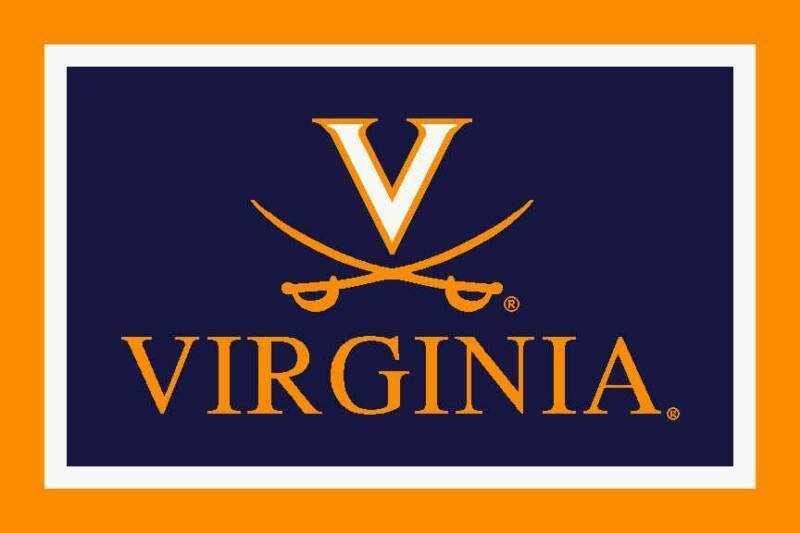 I want to see a club team upset Virginia to epitomize this season but then I’d fire myself from my own website. Purdue played one game so I’m mad they made it this far. Michigan State is having an off year. Still ranked at #16 in the nation, they have a chance to make some noise. 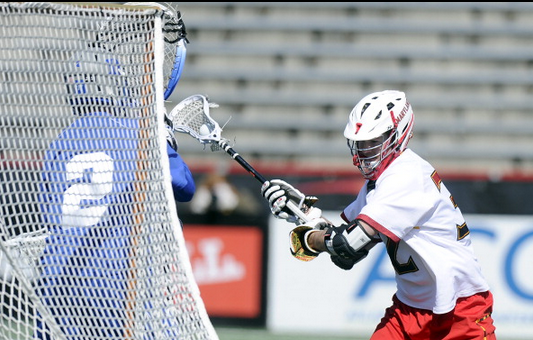 Maryland has figured themselves out, and a 17-5 win over Princeton equates to around 37 goals against Colorado. There was a 45-0 win in the MCLA this year, after all. This game is intriguing and I’m tempted to pick Stony Brook for the upset. The last two wins over Rutgers and Hofstra impress me, but North Carolina is competing in the ACC. There’s only about two or three tough games left on the ‘Wolves schedule, and I still feel the Tar Heels are the better team, even in a “rebuilding” year. How is St. Joseph’s this far along?!? 156 goals. That’s what I know about A&M. Syracuse basketball fans, have no fear, your lacrosse team is awesome. This is an excellent lacrosse game. If this game was on any given Saturday, it would be the game of the day. Competing in the Big East, Nova has a tough schedule coming up after easing into the year. Yet, this is an upset I can justify and I just feel like Villanova, with the nation’s leading scorer Jake Froccoro, is the better team. Another great game and I’m dying for North Carolina out of this bracket because I don’t trust them. I am incredibly impressed with the way Notre Dame came back against Denver and almost won, and think more highly of the Irish than ever. I’m sick of the club teams now. I told Syracuse fans they’d be happy. 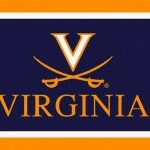 I like the Cuse’ this year a ton, and Virginia really stands for the #Parity we have seen this season. I love Villanova this season. I really mean that. But the Ivy League’s time is now, and I believe in Yale. Game of the year, and it’s happening later this season. By then, Syracuse might have two losses with games against Hopkins and Duke. Notre Dame played great in the test against Denver and I feel the Irish could be the best team in the nation still. The game against Syracuse might actually be a better contest, but this is still incredible. While I do love the Ivy League this season, to me, Notre Dame is the team to beat (after Denver). Congrats to the champs, Notre Dame!